If I thought the nostalgia was bad while writing the Sugarbush review, I can tell it’s already at least ten times worse when it comes to Jay Peak. This beautiful massive mountain that I’ve been told over and over is the “West of the East” was my last stop of sabbatical. I wouldn’t say I saved the best for last (that wouldn’t be fair to all the other mountains), but I definitely didn’t want to end on a low note. Jay Peak made sure that didn’t happen. As for gas stations, restaurants, and all that good stuff – it’s spread out, so just keep an eye out if you’re looking for something specific. You are far from being in the middle of nowhere – so don’t worry. Now, cell phone reception is a different story. We have Verizon and it was all right most of the time but we did swap over to Canadian towers a few times, which won’t work for all phones. Just something to keep in mind! Parking: We got to Jay Peak early enough that parking wasn’t confusing yet, but from the way a bus driver was describing it – it sounds like it can be a headache at times. So my suggestion, find a spot no matter where and use the bus system. They do a great job picking up people and their equipment everywhere, so no need to be running skiers and boarders over while you’re hunting for the elusive front row spot. Much appreciated. Ticket Counter/ Guest Services: Everyone at Jay Peak seemed really friendly – even the guy on the aerial tram I was grilling with questions. You kind of get this idea up there that they know they’re a ski town and they’re perfectly alright with that. 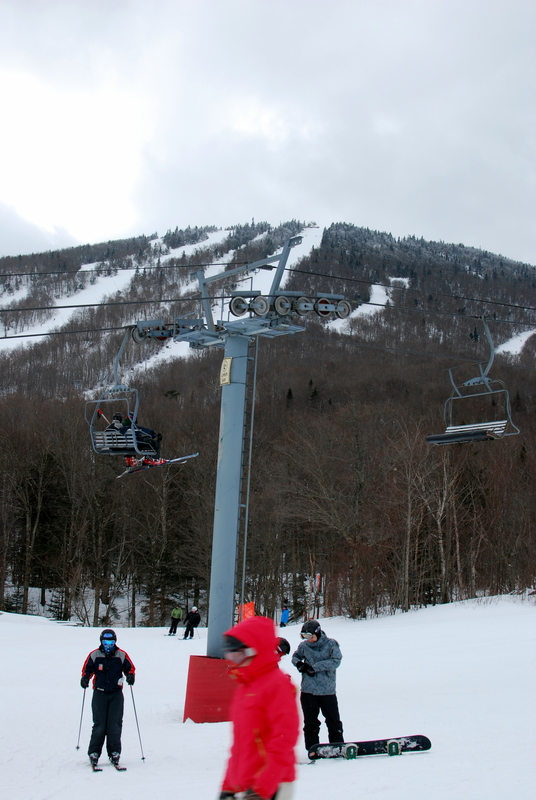 Price: Ticket prices at Jay Peak are comparable with similar sized mountains, so no complaints there. However, a really cool deal to keep in mind is their discount for other mountain season pass holders. Just bring your season pass with you and you’ll be paying $20 less at the ticket counter ($55 versus $75) – every day of the week including holidays. That’s a very sweet deal (and of course what we did). Lodge: When we first got to Jay Peak, it definitely took a moment to figure out the layout of lodges. We parked over at the Stateside Lodge, which is the smaller of the base lodges. While it definitely wasn’t glamorous, it did a great job of giving people a place to get ready, put their stuff, and get going. No camping out and holding tables going on here. The Tram side of things is a lot different. It’s your usual crowded lodge with people hoarding tables like their lives depend on it. It kind of looked like it could use just a little bit of updating (we’re talking paint and lighting here – nothing big). The truly nice building though was the Tram Haus Lodge that contains several restaurants that look like they have pretty incredible food. Anyone try the burgers there? They look like they demand another trip up next winter! Lifts: We rode quite a few of Jay’s lifts and of course the aerial tram, and everything seemed to be in great shape. The one thing I have to say was the coolest was the aerial lift though because it is the only way to get to the higher summit. What makes that cool? You ride up with about forty-five other people and your gear, and actually have enough time to check out the summit and get your gear on before the next group comes up behind you. Nothing like major crowd control to make it feel like you have the mountain to yourself! Trails: After visiting Jay Peak myself, I can officially say that this section of Vermont is the West of the East. Huge peaks looking out over valleys, drop offs heading into steep glades, vertical faces with deep powder, and an attitude I rarely see anywhere else. Seriously, I want to go back. Picks of the day were definitely Vermonter (right off the summit), Power Line, and any variety of glades. Vermonter has insane views along the summit, and isn’t at all a flat boring trail. I was very tempted by the steep glades coming off it, but I’ll save those for next winter. Power Line was just a ridiculous trail. There’s moguls and bumps, and then there’s Power Line. I don’t even know what those where, but the combination of powder, ice, rocks, tree stumps, and who knows what else made for an amazing run. 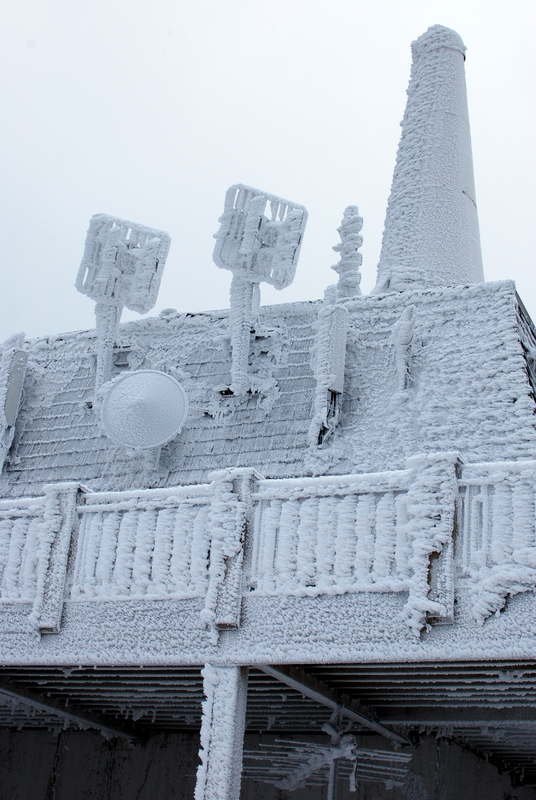 As I said in the Sugarbush review, I was officially chicken tendered out by the time I got to Jay Peak. Therefore, Jay Peak sadly won’t get a chicken tender review. I’m sure it was tasty, but we opted for pizza instead. Next time, I promise. And with that, I am officially caught up on the ski areas reviews of the 2011-2012 season. Woah. I didn’t think that was possible. Now, before you all assume that Tenders & Trails is going to go silent while I mope about the lack of snow, quite the contrary. I’m about to embark on a warmer themed continuation of the adventures and reviews, so keep an eye out for a new what-the-heck-am-I-doing themed post soon! Don’t forget the Cranmore Mountain Lodge extravaganza. Rob, what happened? We only saw you for about 2 seconds? Jillian, it’s not the end, it’s just the begininning. He thought I was going to edit him out, so he kept it brief! I’m sure he’ll be in future videos. And it’s very much the beginning, but it is nice to be caught up on these particular reviews. Curious to see where this summer takes me, and I’m sure next winter will only be even more interesting! I so want to go. This is the first little tour I’ve seen of Jay! Thanks for pointing it out today on Twitter.